There have been quite a few names thrown around for the role of B.A. Baracus in 20th Century Fox's "The A-Team" movie (none of which have been too exciting). 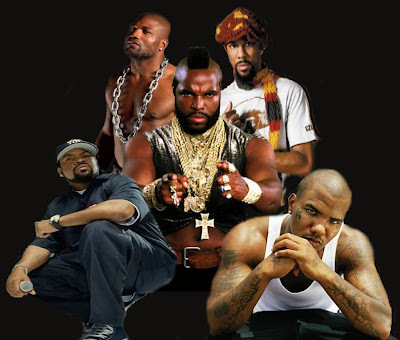 Today comes news that another Rapper has been added to the list of possible people to play the role made famous by Mr. T. Blackfilm reports that West Coast Rapper 'The Game' could potentially play the role in the Joe Carnahan film. Other actors being considered for the role include Ice Cube, Common and MMA fighter Quinton 'Rampage' Jackson. Blackfilm states that due to scheduling conflicts 'The Game' may already be out of the running for the role because he is currently filming "Just Right" with Queen Latifah which wont finish until after the August start date for "The A-Team". While 'The Game' definately has a bad attitude like B.A. initals indicate, I hate the idea of him playing Baracus. Personally I hate every single name that has been mentioned thus far and loath the idea of anybody re-creating his character. B.A. Baracus would be better served if they re-tooled his character completely. As far as the other names on the list Common doesn't seem to have the flare needed for the role. Ice Cube has the star potential, though he has been lackluster in prior action films. Quinton 'Rampage' Jackson definatley has the look, but I seriously doubt he has the chops to pull of a supporting roll. Previously announced Liam Neeson and Bradley Cooper have been cast in "The A-Team" and will play Col. John "Hannibal" Smith and Lt. Templeton "The Faceman". "The A-Team" is being directed by Joe Carnahan with both Tony and Ridley Scott serving as producers and is slated for a June 11th, 2010 release. The update of the popular television series will follow a group of Iraq War veterans (instead of Vietnam vets) who look to clear their name with the U.S. military, who suspect the four men of committing a crime for which they were framed.